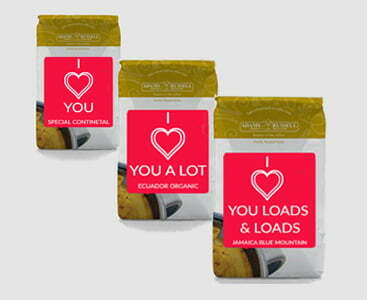 This special Valentine’s bundle contains three specially selected coffees, which includes our continental blend, Kenyan Jungle Estate and Jamaican Blue Mountain. These 3 delicious products make the perfect gift for any coffee lover, and this bundle is sure to leave a lasting impression. We have put together 3 of our best coffees so that customers have an easy and convenient gift for their loved one this Valentine’s Day. To add an extra special touch, we have also worked hard to specially design a brand new label for these products. Featuring touching messages such as ‘I ❤️ you’, ‘I ❤️ you a lot’ and ‘I ❤️ you loads & loads’, this gift is a simple way to make a big impact. Our team thrives on using creative skills to design unique gifts that coffee lovers will cherish. Our Continental Blend is the first up in the bundle. With smooth chocolate notes, a touch of sweetness and undeniable richness, this has proved popular amongst many of our customers. Our Kenya Blue Mountain Jungle Estate is next in the line-up. A bright acidity, smooth berry flavour and floral aroma come together to create a light and tasty cup that excites the taste buds. The Jamaica Blue Mountain is not only the most luxurious coffee that we offer, but one of the most luxurious coffees in the world. The small amounts produced, superb growing conditions, premium harvesting practices and irresistible flavours make this a product every coffee lover needs to try. Experience a light body, low acidity, delicate floral aroma and soothing flavour. At Adams + Russell we provide premium quality gift sets that are the perfect present for your loved ones. Here is the perfect place to buy your Valentine’s Day present as it includes conveniently sized 227g bags. This is the ideal size to test some of our most popular coffees and enjoy the premium quality. The convenient size allows you to try our freshly roasted beans or ground before they lose their freshness. Bigger sizes could result in stale beans by the time you get the end of the bag. All you have to do is decide whether you’d like beans or ground for this delightful gift. If you’re opting for beans, take a look at our range of electric and hand grinders.